America may be moving from a fact-based era to a faith-based era. Such a transition is nothing new; it has happened at least a couple of times already in the history of Western civilization. After the logic and science of the ancient Greeks and the technology of the ancient Romans, Europe moved into the faith-based Dark Ages. 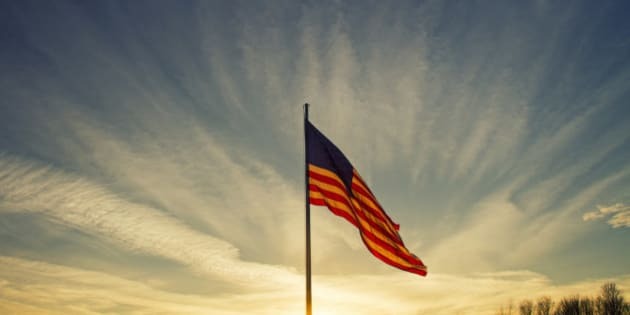 The sun sets behind a large flapping American flag under a blue sky. It's being said that America is entering a post-truth era. It seems that truth is no longer of paramount importance or, as the Oxford dictionary more formally puts it, "objective facts are less influential in shaping public opinion." If Thomas Jefferson came down tomorrow to proclaim that "honesty is the first chapter in the book of wisdom," Americans would ask him to move out of the way so they could finish watching the rest of Survivor or forward the latest fake news story. George Washington's cherry tree story would be pointless. Oaths like "the truth, the whole truth, and nothing but the truth" will seem quaint. Many Americans won't be outraged by election tampering, even by a foreign country. The truth will no longer hurt. But the fading of truth may be just one aspect of what is happening. In reality -- if one can still use that word -- America may be moving from a fact-based era to a faith-based era. Such a transition is nothing new; it has happened at least a couple of times already in the history of Western civilization. After the logic and science of the ancient Greeks and the technology of the ancient Romans, Europe moved into the faith-based Dark Ages. After several centuries, there was movement again via the Renaissance and the Enlightenment into the fact-based Industrial Revolution. And now, once again, the pendulum seems to be swinging the other way in America. Where facts and evidence are not important, education is not essential, analysis is not necessary, experts are powerless, and traditional news media is an anachronism. Facts can be complicated. Faith - like a tweet - is simple and difficult to argue against. And faith can morphed at will to support our thinking at any given moment in time. This shift from truth to non-truth and from fact-based to faith-based seems to be also accompanied by a move from global to national -- which seems to make sense. When searching for truth, you often look beyond yourself, your beliefs, and your borders. If you're not looking for truth but relying on faith, you tend to exclude those who threaten your beliefs and group with those who support it. By questioning its international treaties (defence, trade, climate), backing out of some, and criticizing the UN, America is moving from an era of globalization to an era of nationalism or isolation. America is not alone in its shift. In fact, some nations are ahead of the curve. While much of America is now opposing the influx of Islamic immigrants, parts of the Islamic Middle East long ago had enough of American interference. As just one example, in 1953, the American CIA and the British MI6 helped to overthrow Iran's democratically-elected prime minister Mohammad Mosaddegh and replaced him with their own man, Mohammad Reza Pahlavi, to retain access to Iran's oil. Then in 1979, Iranians chose a similar path to what Americans are doing now. They wanted to return to a more religious, culturally protective, faith-based time, so they deposed their American-backed Shah and chose Ayatollah Khomeini. They wanted to turn their back on Western culture and influence and look inwards for their inspiration. Recently, Britain voted to leave the EU, preferring its own counsel. Now, the US wants to turn its back on the world and particularly Muslim immigrants. Other nations may soon be following suit. Trump's results may portend victories next year for France's Marine Le Pen and Germany's Frauke Petry. The utopian notion that there will be no states, no borders, and that we'll all share a common truth seems unlikely or at least, not sustainable. Our tribal instinct may be too strong. However, America's inward shift may not be all bad. It may give Americans time to reflect and repair, to not take their multitude of rights and freedoms for granted, to think of what they want for their own future, and determine what role they want to play internationally. All the world need not be their stage and Americans are not the only players. America entering the "Dark Ages" may be good for other nations as well, forcing them to become more self-reliant. Countries that depend on American aid could learn how to wean themselves off this support. Countries that depend on American defense can learn how to protect themselves. The Middle East may be better off without America's hovering presence; its friends may have to govern with their peoples' welfare in mind, its enemies can have a chance to manage their countries without American hindrance, and Israel could at long last try to get along with its neighbours. Not having a hegemony of American culture blanketing the world may enable some countries to breathe easier and local cultures to flourish. Although I must admit, I'll miss episodes of Madame Secretary. Just as how China pulling up its drawbridge after circumnavigating the world in the early 1400's (having decided that there was nothing of import outside their own country) allowed for the rise of the Ottoman empire, the European empires, and most recently the American empire, the U.S. pulling up its drawbridge and withdrawing into itself will give other nations - and indeed other empires -- a chance to rise. Good morning 2017. Good night America ... wherever you are.